Yesterday was test ride day. 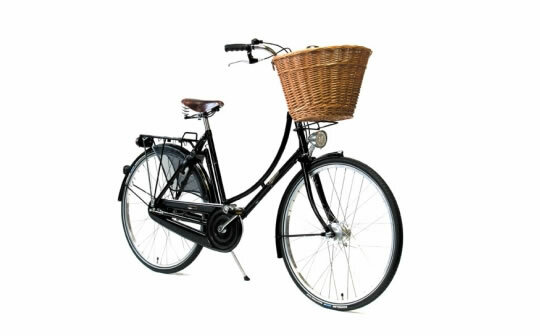 After consulting the whole world, the bike I have ended up ordering is the Pashley Princess Sovereign, in Buckingham Black. Before we entered the shop I was having doubts about whether it was the right decision. After all, it’s a bike with a design dating back to the 1930’s and apart from some nice specification upgrades (Sturmey Archer hub brakes and Schwalbe puncture resistant Marathon Plus tyres) it hasn’t changed since. On the one hand, it’s outdated, a bit silly and completely unsuitable for riding around hilly Leeds. On the other hand, I’ve always wanted one. It’s the sheer unadulterated beauty of the machine, coupled with a very strong rose-tinted view of life atop a Pashley that’s done it. I’m basically yearning to be a character in an Enid Blyton book. My lovely (long suffering) husband said to me that I should stop being practical and just go with my guts. As we went upstairs and I saw ‘my’ bike waiting for me, I grinned a giant grin. That was it. I was in love. One test ride up and down the local roads later and it was completely confirmed. This is the bike I want. Rose-tinted and impractical it may be, riding it was an utter, utter joy. Sitting upright gives you a similar body position as on a horse, rather than sitting forward, which I find really comfortable. There is no getting around the fact that it weighs an absolute ton, but I’m not going anywhere near Alpe d’Huez any time soon. Apart from using it to cycle to some of my work projects, I will mostly be pootling around after my kids on their little bikes, so that doesn’t matter. The giant basket in the front can hold all manner of baby wipes, soft toys, blankets, sweets and other essentials for a family outing. As for Cycletta, well, I’ll be at the back, sitting upright, and grinning all the way round. As we left the shop, after reserving the bike and going home to sort out the rest of the paperwork, I did a little bit of happy crying. It’s a rare feeling to have exactly the thing I want, after waiting for years and years for it. I’m still smiling now, just remembering the test ride, and knowing that after a few more weeks of waiting, it will be coming home with me. Ten ways to keep exercise motivation. I’m so jealous, have secretly been hankering after one of these for ages. Like you I love the idea of being a character in an Enid Blyton story; or maybe Judith Dunbar in ‘Coming Home,’ riding her new bicycle round the Cornish lanes. Hope you have lots of fun with it, I particularly like the basket and the fact its for a Lady. Pls tell me, do they do it in green? Enjoy and keep us up to date with your rides on it.